In NinJump Deluxe, you control a ninja who jumps on your command. That is the only control. 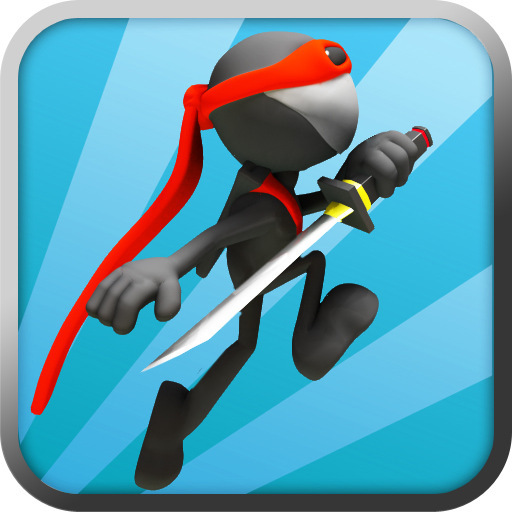 The ninja runs upward either on the left or the right, and tapping will cause him to jump to the other side. While he jumps, he also swings his sword, so jumping across not only gets you to the other side, but is also used to attack enemies. You may jump across to avoid an obstacle or blockage, or you may need to slice through an enemy. There are several different types of enemies, and you’ll encounter more and more the higher you climb. A perk is that killing three enemies of the same type in a row will give you a pretty huge boost upward. You may also encounter shields, which obviously shield you from whatever dangers lurk out there. Once you hit something bad, the shield vanishes. It’s job is done. Aside from the pretty uninteresting game, NinJump Deluxe features four options of scenery for you to play. You’ve got the castle, pirate ship, jungle, or classic. They’re all the same game with changes in the scenery and enemies. One problem with this game is that the sounds are here or there. They will often stop for a while, then come back, then stop for a while, then come back… Also, each scene is independent with scores, so if you get a really good score on the pirate ship, that does not carry over when you play in a different place. This is stupid, since the game is the same at each place. But whatever, just another reason to let NinJump Deluxe slip by. Overall, I am wholly disappointed with NinJump Deluxe. 3/10.